Both devices shipped to us with MIUI 9. However, during the course of our testing, both received the MIUI 10 update, which is the latest iteration of Xiaomi's skin. MIUI 10 comes with a handful of new features, mostly notably a new design and improved app performance. The UI is the most obvious change in the new version, with several parts of the UI getting a fresh coat of paint while other mostly remaining the same. The launcher is one of those things that has mostly remained the same. You still can't press and hold on app icons to access app shortcuts. Third party app icons still have an ugly square border around them, even though Xiaomi's own apps no longer have a border anymore in the new default theme. You still can't choose to enable a standard app drawer. The launcher remains one of the weakest aspects of MIUI. One random issue on both of our units was that most of the built-in wallpapers were extremely blurry and unusable. The notification shade has been improved. It slides down with a new animation and immediately you'll notice the new brightness control, which is much bigger and easier to access. Another swipe down expands the toggles. You can arrange them and add more but you still can't have fewer than eleven of them at any time for some reason, even if you don't intend to use all of them. The biggest change is to the overview or multitasking menu. The apps now tile across the screen in a grid that makes better use of the screen space. No longer do you have just one and a half app window wasting your viewable area, requiring you to constantly scroll even to access the third or fourth app in the list. The new arrangement shows the recent four apps at the top, making switching easy. We also noticed Xiaomi finally added support for the notification channel feature introduced in Android 8.0. This gives you more fine-grained control over an app's notifications should the developer choose to enable such additional options. Apart from that, several of the built-in apps also got a redesign. There is a new Clock app, along with new Calculator, Weather, Security, and Browser apps. Many of the others also received a nip and tuck here and there. The volume adjustment UI has also been overhauled. You get a larger slider when you press the volume button that not by default adjusts the media volume. You can also choose to quickly put the phone in silent mode. Another button shows all three volume bars so you can adjust the ringtone or alarm volume as well from within any app. It's pretty cool. Apart from that, there's not much else new we noticed. Several of the other apps are either the same or so slightly changed they look the same. While Xiaomi's yearly Botox injections are nice and appreciated, it seems the company rarely ever chooses to address the major issues with the UI. The launcher as we mentioned before is absolutely abysmal. The Settings app is still a confusing mess to anyone who isn't a long-time Xiaomi user. There's also the whole app situation. Xiaomi seems okay to seemingly have a duplicate app for every Google app. It makes sense in China where Google apps aren't available but there is no reason to ship the MIUI version of the Google apps in other markets, yet, here we are. There are two browsers, two music players, two photo galleries, two keyboards, and even two app stores. The only purpose Xiaomi's own app store serves is updating its own apps, which, as we've seen on LG phones, can be done in other ways. If the built-in apps weren't bad enough, the phones also come loaded with third-party apps. If you count the UC Browser that's also installed, the phones actually come with three web browsers out of the box. The only good thing about this situation is that you can uninstall most of them and Xiaomi makes it very easy to install multiple apps all at once. However, some apps cannot be uninstalled. One of these apps is the new default keyboard Facemoji, which is a third-party app also available on the Play Store. You are made to agree to the keyboard's terms and conditions of collecting user data when you set up the phone and you have little choice in the matter as without accepting you can't go any further in the setup process. There's also Gboard, which comes pre-installed, but you have to switch to it manually and even after that you can't actually uninstall or disable Facemoji from your phone. But including third-party apps isn't the only source of revenue for Xiaomi. Unfortunately, many of the phone's built-in apps also have ads and promotional content baked in, none of which can be removed. The web browser will also routinely push notifications that include ads. It feels like you bought a trial version of a phone with ads instead of the real thing for the full price. Speaking of notifications, many of Xiaomi's stock apps constantly harass you with notifications. Most apps will push a notification every now and then to tell you to enable some feature or the other. Xiaomi's app store will constantly keep telling you to install their promoted apps. As someone now completely aware of this, the first thing we ever do with any new Xiaomi phone now is disable the notification for every app that comes built-in. However, this cannot be done for some apps, which don't let you adjust their notification settings. Still, you can pretty much turn off 99% of them and get a much more peaceful experience, something we greatly recommend if you happen to have one of these phones. Unfortunately, most users will never do any of this and will just suffer through the constant bombardment of notifications and advertisements among all the bloatware filled mess that is MIUI. The main difference between the Redmi 6 and the Redmi 6 is the chipset and memory situation. The Redmi 6 has a more powerful MediaTek Helio P22 while the cheaper Redmi 6A has a MediaTek Helio A22. The Redmi 6 also comes with 3GB memory while the Redmi 6A is limited to just 2GB. The difference in performance between the two phones is more than we'd like to see. The Redmi 6 actually works reasonably well and for day to day use is actually quite usable. It's not a perfectly smooth, stutter-free experience but even when it does stutter, it picks itself up with grace and continues working. For most users, performance on offer here should be satisfactory for the price. 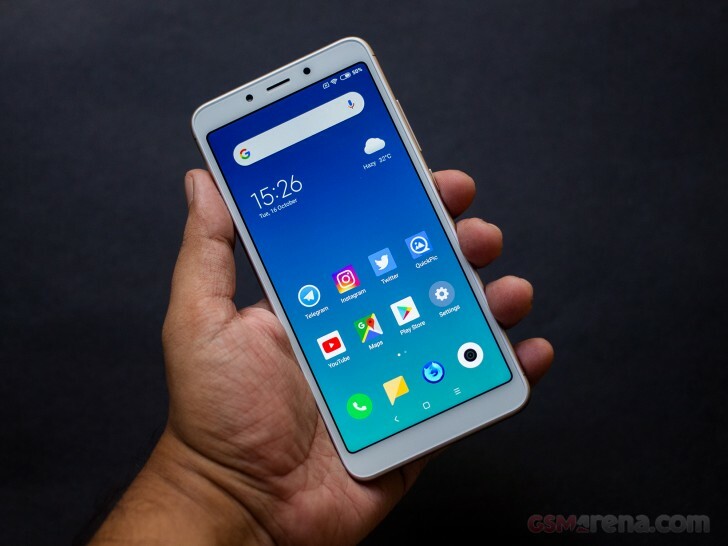 The Redmi 6A, on the other hand, performs rather poorly. It's consistently slow through the UI, with constant stuttering and slowdowns. This makes using the phone an absolute chore, even in its brand new, out of the box form. Pretty much everything you do on this phone is met with some amount of slowdown and stuttering. The performance is simply not acceptable, even for the price.